Convenient parking is available near Maggie Daley Park. Refer to the map for more information on parking or to reserve a guaranteed space. Located in Chicago's Loop, Maggie Daley Park is a 20-acre park near Lake Michigan and Grant Park which connects to Millennium Park via the BP Pedestrian Bridge. 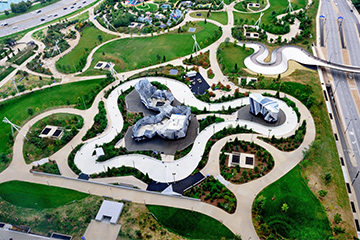 The park features a field house, an ice skating ribbon, climbing walls, a children's playground, mini golf course, picnic groves, tennis courts, and a formal garden. The Maggie Daley fieldhouse hosts Chicago Park District programming, including the Park District's popular Summer Day Camp.